Once slated for release last fall, and then pushed back to January of 2014, the fantasy adaptation The Seventh Son, based on The Last Apprentice (or The Wardstone Chronicles) book series by Joseph Delaney, is finally coming to theaters. Universal inherited the Legendary Pictures project from Warner Bros. when the production company switched studios, and it's getting an expected dumping ground release in February of next year. It's a shame, because there seem to be some cool creatures and action in this new trailer, and Legendary is pushing their Godzilla street cred alongside a showcase of some big monsters to get audiences on board for the early 2015 release that stars Jeff Bridges and Julianne Moore. Watch it! When Thomas (Ben Barnes), seventh son of a seventh son, is apprenticed to the local Spook (Jeff Bridges), whose job is to fight evil spirits and witches, he expects a life of danger. However, the boy doesn't realize just how soon he'll face a powerful enemy alone, as Mother Malkin (Julianne Moore) escapes her confinement while the Spook is away. Thomas is forced to use his wits, and the help of his enigmatic new friend, Alice (Alica Vikander), to fight the evil witch. And defeating her is only the start of the boy's problems. 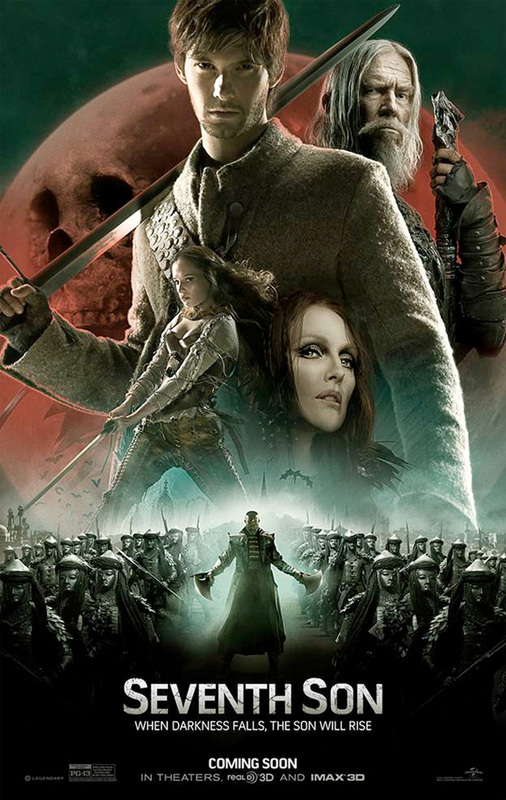 The Seventh Son is directed by Sergein Bodrov and arrives in theaters on February 6, 2015. Effects look poor. This seems to be a very common problem these days... that and a crappy plot. I just can't trust movie trailers anymore. Well, the sad thing is that the effects are probably more representative of 2012-2013. This movie was supposed to be released as early as 2013, but then was, to my knowledge, finished and set to open at the start of 2014...before Legendary took it with them from Warner Bros over to Universal...and they moved the release date back a year. So, this isn't a $200 million, top of the line production, the CGI was never going to be on the level of something like Avatar or The Avengers. But even for what THIS movie is....it is sort of being misrepresented because the effects are already a few years old upon the release of the film. When movies like this are coming out, alls i ever hear is "oh the effects look poor, blah blah blah". Do you really expect for every movie to be on the same production level in graphics as James Cameron or perhaps George Lucas? Just WTF are you expecting? Can you do a better job?! I sincerely doubt it. When you say "movies like this" I'm assuming you mean films that, with out VFX would never ever be made... So in that regard, the VFX 'should' be a selling point, and should be great. What people expect, is a story as it was told in the books - thrilling adventure, with fantasy creatures, exotic worlds that captivate you....I can't see how they can expect to accomplish that level of story telling in a compelling way with less than strong VFX - so Brandon's comments are well within their right for "movies like this". The fact that you mentioned James Cameran and George Lucas proves that when its done right, it gets quoted as 'the benchmark'. Well then let me be the first to tell you that not everyone has James or George's success and wealth and connections to make "movies like this" to YOUR satisfaction. Perhaps you should cry a river and send the VFX team a letter concerning your high-standards, otherwise sit down and watch the fkn movie...........or dont. The monsters look kind of cool but Jeff Bridges sounds like what Trey Parker might sound like doing a Jeff Bridges voice. I mean, it at least looks like it is loaded with monsters and action....so maybe in the end it'll get away with that like Van Helsing? I love that movie just for the non-stop fun, excitement, and creature encounters it has. So at best it might be the next Van Helsing, at worst....it might not be worth seeing. Either way, it has been a LONG delayed film, and I imagine the frustrations that come along with that...so part of me will be rooting for this to be good and do well, even if I never see it. That is what I am hoping for. I want awesome B-List action. This looks like a video game trailer : ( I actually read this book and what I liked about it was that it was heavily influenced by supernatural horror and had more than a couple actually scary scenes (in confined spaces and dark settings). This looks more like your run of the mill Eragon/Clash of the Titans/Prince of Persia type of fantasy action. An opportunity wasted, this is, I'd say. I didn't know it was a novel. I will check it out. Dude, half-assed video games look better than this. I really want this to be good, but they usually fall rather short of being epic. You want my $15 at the theater, it better be good. LOL. This is a total WTF, but in the best possible way! Everything looks like it was filmed with a Vaseline covered lens. not that bad at all but all that magic stuff is starting to bore me!